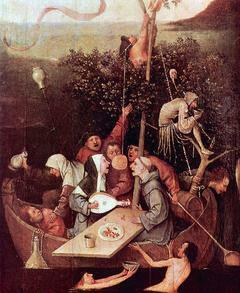 My paper explores the late-medieval image of the ship of fools. The metaphor originates in the fifteenth-century carnivals of Europe and was depicted in Sebastian Brant’s 1494 compilation, Das Narrenschiff. The paper explores the underlying dynamic of the imagery and its origins in carnivalesque rituals as well as how the motif was exploited by Brant, becoming a literary force at the turn of the sixteenth century. The ship of fools has long been present in Western art and literature. The image originates in the late- medieval carnivals of Europe and it condenses the allegory of a barge with a seemingly endless number of fools who are unaware of their lack of control over the ship. This is the main theme of Sebastian Brant’s Das Narrenschiff (1494, Basel, from now on The Ship of Fools), a late-medieval enumeration of fools with 112 chapters in verse depicting such types of folly as adultery, heeding bad advisors, or vanity. Each verse is accompanied by a woodcut which exhibits a fool or a group of fools relevant to the chapter. The metaphor is rarely discussed outside the realm of German studies, despite the fact that it became highly popular across Europe at the turn of the sixteenth century and its impact has been considerable ever since then. Academic papers on The Ship of Fools written in English have failed to elaborate on its ritualistic significance; although its origin in medieval popular culture has been acknowledged, the work has been mainly regarded as a satire castigating human weakness. Undoubtedly, The Ship of Fools identifies folly with sin, however, the work’s significance points beyond mere castigation and condemnation of human faults as the piece seems to be deeply rooted in ritualistic expressions of popular culture. This paper argues that the late medieval fool plays of carnivals seeped into Brant’s work and became the main governing idea behind it. In order to substantiate this, I shall discuss the underlying dynamics of the imagery, its use in popular performances of carnivals, and finally I will demonstrate how the carnivalesque tradition of The Ship of Fools and its iconology were recorded and articulated in the form of Sebastian Brant’s The Ship of Fools.